This morning I attended the uncovering of the second solar boat pit at Giza with Professor Sakuji Yoshimura, Director of the Waseda University Mission Team in Egypt. We revealed the delicate wooden boat in the pit and also had a surprise archaeological discovery! Boats were the most important form of transport in Ancient Egypt and vital for travel and trade. It is not surprising that the boat held symbolic meaning to the people of Ancient Egypt, becoming an integral part of religious beliefs and visions of the afterlife. It is likely that the Solar Boats surrounding the Great Pyramid were intended to be used by the deceased king in his journey across the sky. Ancient Egyptians believed that the sun-god ‘Ra’ navigated the sky and the underworld in a solar boat, and if you were lucky and became a member of the crew of a solar boat you would sail for eternity in the company of gods. The first solar boat near the Great Pyramid was discovered in 1954 by the Egyptian archaeologist Kamal el-Mallakh. Following an excavation, the boat was lovingly restored by experts and is now on display in the Solar Boat Museum. But it was also during this initial survey that investigators located a similar structure just beside the first solar boat. The second boat was left untouched for over 30 years before the Ministry of State for Antiquities and a delegation from Waseda University in Japan carried out an electromagnetic wave survey in 1987. All this initial research improved our understanding of the area surrounding the pit and we could start to plan the best possible way to protect the remains inside. A collaborative 5-year project between the MSA and the Waseda University Mission Team in Egypt led by Professor Sakuji Yoshimura began in April 2009. The first phase of the project assessed the area surrounding the second boat pit by using both a topographical survey and a radar survey. A large hanger was constructed over the area surrounding the second boat pit, with a smaller hanger inside to cover the top of the boat itself. The hangers were designed to protect the wooden remains during analysis and treatment. A laser scanning survey also documented the area and wall between the Great Pyramid and the boat pit. Plans are now underway to construct a temporary magazine and laboratory inside the hanger to use during the restoration process. The latest technological equipment is to be installed, with a device to adjust the temperature and humidity vital to the preservation of the wooden boat remains. Today marks the start of the second phase of the project that will involve raising the stone blocks covering the boat pit. 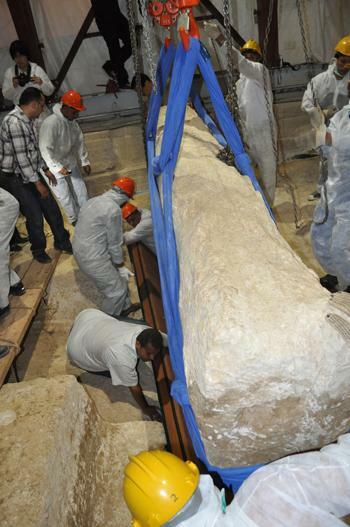 The first stone block, out of a total of 41, was carefully lifted this morning. To give you some idea of the scale of the blocks, the biggest one measures 1m wide by 4.10m lengthways and weights 16 tons. Such an unusual operation requires unique techniques, in this case developed by the Egyptian and Japanese teams on site. The process involves inserting a piece of wood beneath the cover stone. Each piece has been designed specifically for this purpose, chemically treated, and layered with heat insulation. So strong it could hold the weight of one person! Yesterday, the Egyptian and Japanese teams conducted an experiment to clean the fillings around the sides of the covering stones. During this procedure they revealed a cartouche for King Khufu and beside it was the name of the crown prince Djedefre, without cartouche. This is a very great discovery. It is the second cartouche of the great King Khufu to be found in the pyramid complex – the first was inside the Great Pyramid – and it proves to us that this boat was constructed during the time of King Khufu. The restored solar boat in the Solar Boat Museum lay in a boat pit displaying a mason’s mark of a cartouche for Djedefre – Khufu’s successor. It was therefore constructed at a later date, after the death of King Khufu when Djedefre became king. The wooden remains will be carefully extracted and preserved. 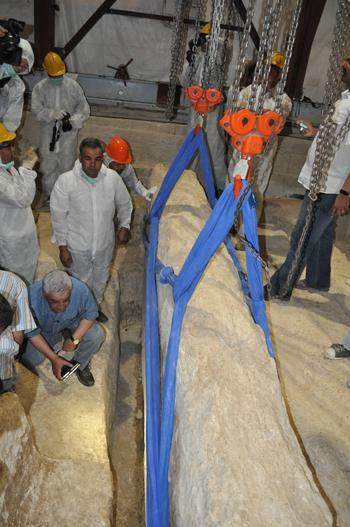 The boat will be reconstructed and put on display in a special building designed specifically for the boat at the Grand Egyptian Museum.